IMAGE: Sb atoms and Te atoms serve as the glue to fix the N-S orientations of Cr atoms in Cr-doped (Sb, Bi)2Te3. This makes the material ferromagnetic. A group of researchers in Japan and China identified the requirements for the development of new types of extremely low power consumption electric devices by studying Cr-doped (Sb, Bi)2Te3 thin films. This study has been reported in Nature Communications. At extremely low temperatures, an electric current flows around the edge of the film without energy loss, and under no external magnetic field. This attractive phenomenon is due to the material's ferromagnetic properties; however, so far, it has been unclear how the material gains this property. For the first time, researchers have revealed the mechanism by which this occurs. "Hopefully, this achievement will lead to the creation of novel materials that operate at room temperature in the future," said Akio Kimura, a professor at Hiroshima University and a member of the research group. Their achievement can be traced back to the discovery of the quantum Hall effect in the 1980's, where an electric current flows along an edge (or interface) without energy loss. However, this requires both a large external magnetic field and an extremely low temperature. This is why practical applications have not been possible. Researchers believed that this problem could be overcome with new materials called topological insulators that have ferromagnetic properties such as those found in Cr-doped (Sb, Bi)2Te3. A topological insulator, predicted in 2005 and first observed in 2007, is neither a metal nor an insulator, and has exotic properties. For example, an electric current is generated only at the surface or the edge of the material, while no electric current is generated inside it. It looks as if only the surface or the edge of the material has metallic properties, while on the inside it is an insulator. At extremely low temperatures, a thin film made of Cr-doped (Sb, Bi)2Te3 shows a peculiar phenomenon. As the film itself is ferromagnetic, an electric current is spontaneously generated without an external magnetic field and electric current flows only around the edge of the film without energy loss. However, it was previously unknown as to why Cr-doped (Sb, Bi)2Te3 had such ferromagnetic properties that allowed it to generate electric current. "That's why we selected the material as the object of our study," said Professor Kimura. Because Cr is a magnetic element, a Cr atom is equivalent to an atomic-sized magnet. The N-S orientations of such atomic-sized magnets tend to be aligned in parallel by the interactions between the Cr atoms. When the N-S orientations of Cr atoms in Cr-doped (Sb, Bi)2Te3 are aligned in parallel, the material exhibits ferromagnetism. However, the interatomic distances between the Cr atoms in the material are, in fact, too long to interact sufficiently to make the material ferromagnetic. 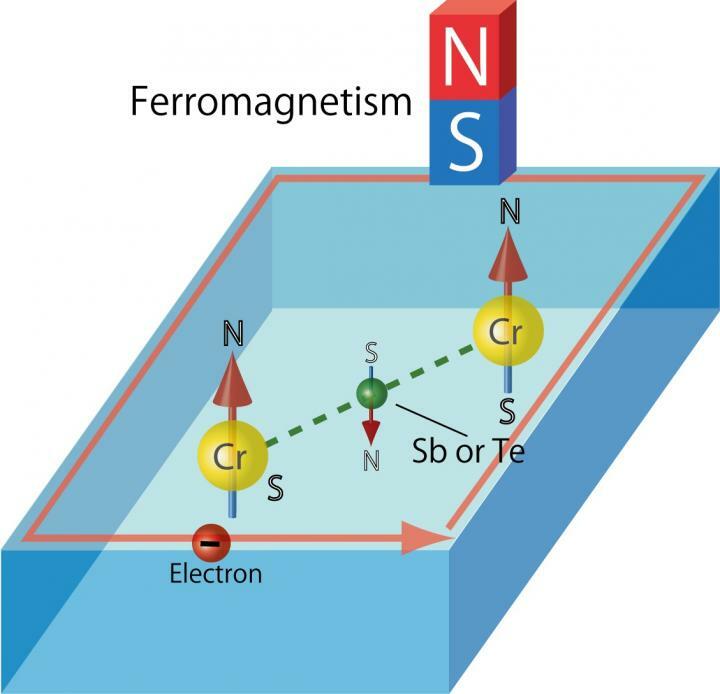 The group found that the non-magnetic element atoms, such as the Sb and Te atoms, mediate the magnetic interactions between Cr atoms and serve as the glue to fix the N-S orientations of Cr atoms that face one direction. In addition, the group expects that its finding will provide a way to increase the critical temperature for relevant device applications. The experiments for this research were mainly conducted at SPring-8. "We would not have achieved perfect results without the facilities and the staff there. They devoted themselves to detecting the extremely subtle magnetism that the atoms of non-magnetic elements exhibit with extremely high precision. I greatly appreciate their efforts," Kimura said.